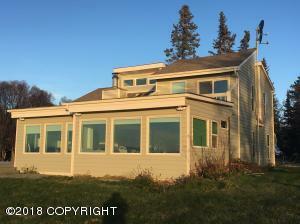 DESCRIPTION: Cook Inlet View Home - Professionally designed with an open floor plan to take advantage of the mountain and Cook Inlet views. Enjoy the view from the large sun room that includes a jetted hot tub. Recent upgrades include new siding, tripane pane windows, new roof, decking and large shed for extra storage. Master bedroom has french doors that open to the sun room to take in the view. DRIVING DIRECTIONS: North on Kenai Spur Hwy, turn left at mile 17 onto Lewis. Go straight to house, address is on Stipend Circle.